Before digital photos we had photo albums. We went to One Hour Photo, had our pictures processed and put them in some sort of cute vacation-themed scrapbook. At least that's what I used to do. It was pretty much a no-brainer and pretty easy to pull out for family and friends to see. On our recent trip I took 684 photos. And that was even after editing and deleting every night in the hotel room. 684 photos. Ridiculous huh? Yeah. After we got home and settled back into our lives, I started thinking about creating some sort of digital scrap book. Being an avid flickr user, I knew that an on-line gallery was one option. So I uploaded a good percentage of my photos to my flickr account and yes, we now have the option to view them in a slideshow format. Sitting at a computer screen. One day while cruising around flickr, I found a partner website called Snapfish that links directly to your already uploaded sets of photos. The site offers all kinds of products you can create from your photos. I designed 5x7 photo books using their easy-to-use template. Prices are based on the size of your book and the number of photos you use. 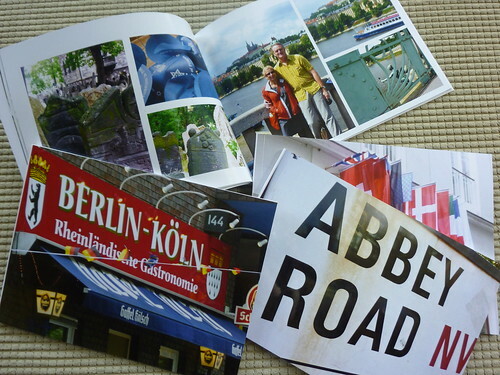 I decided to make a book for each city we visited and put my favorite photos on the booklet covers. There's something about holding a book in my hands and leafing through the pages that is very satisfying to me. Their compact size makes them easy to carry in my purse and pull out at a moment's notice to share with friends and family. Whether they want to see them or not! What a great idea! I've been trying to figure out how to physically contain all of my Euro-trip photos... I'm loving this book idea! I just may follow in your footsteps! Great Idea! I need to check into doing this. Thanks Elaine! Check it out...very user friendly and inexpensive. Have a great day!